This is a high quality exact fiberglass reproduction of the shifter porches used in 1961 to 1964 full size Pontiacs, 3 or 4 speed, with or without a console. Just added: 65 to 68 stick shifter porches. Made with hand laid bi directional fiberglass in multi-layers using West Systems epoxy resin to achieve phenomenal strength and ultra light weight. This is a quality product that fits like a glove. We also stock exact duplicates of the 62-64 under console plastic parts. These are the two pieces that everyone forgot to pull when they pulled the four speed console. 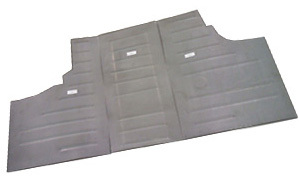 Pontiacparadise.com, the leader in bringing you the hard-to-find full size pontiac parts now brings you the rear rubber cushions for your original T-10 or 3 speed manual transmission mount. These are new, not used and cracked or torn. By the way, did you know your manual transmission mounts at a 15 degree angle towards the drivers side? There are companies that make a solid rubber offset rear mount and market these as mounts for your manual transmission. Wrongo! These are rear mounts for the hydramatic transmissions only and they mount totally straight. If you use one of these, you automatically put a 15 degree stress on the mount right out of the box. Leave them on the shelf! 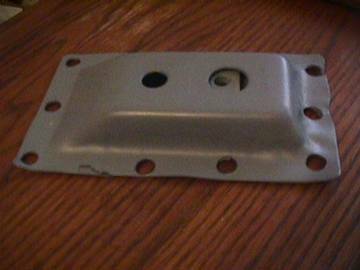 These mounts fit the original transmission mount and the fabcraft replacement unit (which is a fine piece). Price is $25 for the pair delivered to you in the us. Overseas shipping available at cost. Somewhat difficult part to find. 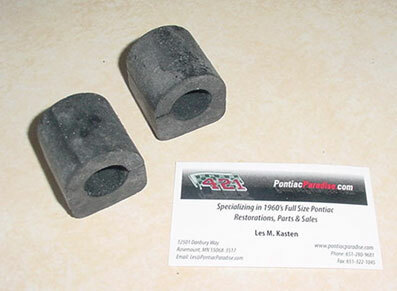 1961 to 1968 Full Size Pontiac Front Sway Bar Bushings. We've got them in stock NOW! 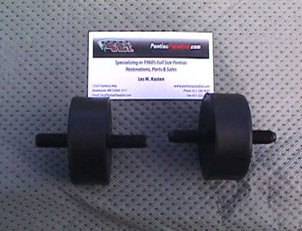 Order Part # PPC-15881 Your cost: $15.00 plus $5.00 shipping via USPS Priority Mail in the lower 48 states. We accept VISA, MasterCard, Discover and PayPal. Call 651-280-9681 to order or order online! We can also ship overnight and overseas. Will do so at cost to you. We ship daily. Manufactured from 18 gauge US made steel, these are sold in three pieces for easy installation without removing your body from the frame. These are very close to the originals in design although the reliefs may not be quite as deep as the originals. Expect to do some cutting and trimming for a good fit, however all are somewhat oversized to allow for this. Fits Bonneville & Star Chief. Fits Catalina, Grand Prix & Ventura. We are currently taking pre-orders and expect to ship in mid-November 2009. 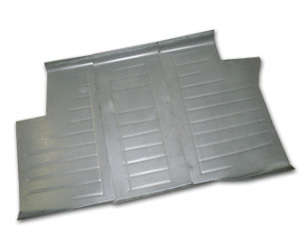 What is the first thing to go under your full size Pontiac? Yes, the trunk mounts. They fill up with sand, dirt, mud, leaves, snow, ice, salt…whatever and they hold it. And when you go to replace your trunk pan, you find these are a lost cause and usually they get cut off with a torch, as the bolts are frozen. Well, no more. PontiacParadise.com IS the source for these. They are US MADE and use 14 gauge steel. They have the same appearance as the original mounts. The can be either bolted or welded (suggested) on to either side as they are totally interchangeable. Overseas shipping available at cost. Please call. Note: Because of different applications, the rubber mounts and bolts thru the mounts are not included. These are available from the larger big car suppliers such as Ames. What is the first thing to go under your full size Pontiac? They fill up with sand, dirt, mud, leaves, snow, ice, salt…whatever and they hold it. And when you go to replace your trunk pan, you find these are a lost cause and usually they get cut off with a torch, as the bolts are frozen. Well, no more. PontiacParadise.com IS the source for these. They are US MADE and use 14 gauge steel. They have the same appearance as the original mounts. The can be either bolted or welded (suggested) on to either side as they are totally interchangeable. 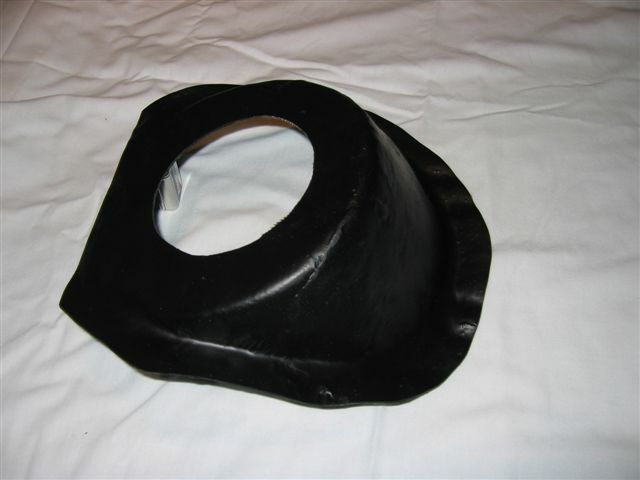 The product photo shows our prototype. We had to drill out the spotwelds. The production version will not have holes on the edges. Has the “floating nut” in place as original. 1961 thru 1964 Pontiac Full Size Gas Tank, 25 gal. NEW RELEASE For Bonneville, Catalina, 2+2, Ventura, Star Chief & Grand Prix, (EXCEPT station wagon). Original GM part #9776546, Hollander #112. This is a Steel tank and made per original design. The tank has a special coating as to prevent rust. Tank has a 3 year manufacturer warranty. NOTE: Must transfer old filler neck to new tank. We DO have new sending units, neck “O” rings and strap sets available. This is a high quality replacement tank! Includes: Fuel Tank, Strap Set, Sending Unit (Double Line), Filler Neck “O” Ring. Includes: Fuel Tank, Strap Set, Sending Unit (Single Line), Filler Neck “O” Ring. 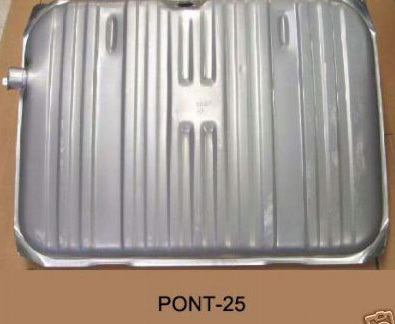 Can Be Used (with modifications) for 61 to 64 Full Size Pontiacs. Same basic length as 61 to 64 Pontiac Clutch Fork. Uses same size throw out bearing as 61 to 64 Pontiac. Uses the clevis pin attachment, same as 61 to 64 Pontiac, however your clutch rod that holds the clevis pin MUST be shortened the distance of the excess angle. This will work in lieu of an original clutch fork. Originals on eBay always go for in excess of $200 used.